The large Discovery zero clearance fireplace by Lopi is the ideal built-in heating solution. With it’s direct vent top or rear vent design you can install this beautiful fireplace easily in your living room, bedroom, kitchen and even bath. The variable 40,000 BTU/hour fire utilizes a unique two-stage heat exchange system to achieve up to a remarkable 87% efficiency. 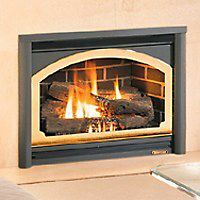 The Discovery fireplace is certified as a “direct vent furnace” distinguishing it from non-heating “decorative” gas appliances.